Our new NIXE recessed linear LED luminaire is one of the smallest on the market, measuring only 3/8 inch – barely the width of a fountain pen. It integrates its environment perfectly and seamlessly, without any apparent trims or edges. This benefits aesthetic as well as functional values, keeping the surface even and diffusing light without interruption. We have specially studied and developed its linear optics to create a light source without any visible dots, giving constant and uniform luminance. Despite this technical challenge, NIXE still controls its light distribution. 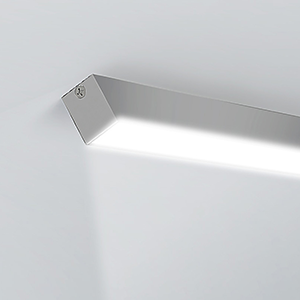 It offers five different light beams, from very narrow to very wide, as well as an asymmetrical distribution. Eklipse Lighting is the only manufacturer on the market to offer a luminaire so small and efficient at the same time. Through constant thermal monitoring and current control, Eklipse intelligent board technology (IBT) maintains optimal light levels and operating temperature preventing harmful overheating by self-adjusting to its environment. 24V: increments of 1” (25 mm), 2” (51 mm), 3” (76 mm) and 8” (203 mm). 40° with some degree of dots visible. 70°. 100° diffused and asymmetric in uniform luminance (no visible dots). Z=Extrusion available in 1” increments, up to 72” (refer to ordering code). Nominal dimensions do not include end caps.